A Cardiff University-led team of scientists are calling for urgent action by health authorities worldwide after it discovered new strains of antibiotic-resistant bacteria in India. It is the first time the bacteria, found in the drinking water supply of Delhi, have been located in the wider environment outside a hospital. The bacteria include species which cause cholera and dysentery. India's Health Ministry dismissed the report as a waste of time. The ministry said the core issue was not whether the water was in any way harmful, which it said it was not, but why the Cardiff University researchers wanted to "put the heat on India". Last year, India rejected reports that the NDM-1 "superbug" had originated in the country's hospitals. India's medical tourism industry is growing rapidly and is estimated to be worth hundreds of millions of dollars. The full findings of the Cardiff University study are published in The Lancet Infectious Diseases. Cardiff scientists were the first to identify the NDM-1 gene which makes bacteria resistant to a large range of antibiotics. Their research was extended when it was discovered that while most patients with the bacteria had recently spent time in hospital in India, some cases had occurred without recent hospital treatment. This then prompted the team to test the wider environment in Delhi. They collected 171 swabs of seepage water and 50 public tap water samples from sites within a 12km radius of central Delhi between September and October 2010. The NDM-1 gene was found in two of the 50 drinking-water samples and 51 of 171 seepage samples. Researchers then identified 11 new species of bacteria carrying the NDM-1 gene, including strains which cause cholera and dysentery. Antibiotics are used to reduce excretion of bacteria in cholera patients, and to reduce the duration and severity of dysentery. Study leader, Prof Tim Walsh, from Cardiff University's School of Medicine, called the results "extremely worrying". "We found resistant bacteria in public water used for drinking, washing and food preparation and also in pools and rivulets in heavily-populated areas where children play," he said. "The spread of resistance to cholera and to a potential-untreatable strain of dysentery is also a cause for extreme concern." The Indian Health Ministry, however, questioned the motives of the scientists who wrote it. It said the study was unsupported by clinical and epidemiological evidence and patients were responding well to medical and post-surgical antibiotic treatment. "The environmental presence of NDM-1 gene carrying bacteria is not a significant finding," a Health Ministry statement said. A ministry spokesman, RK Srivastava, added that bacteria existed naturally everywhere and there was no evidence that anyone had been made ill. Researchers say a recent United Nations report showed 650 million Indian citizens do not have access to a flush toilet and even more probably have no clean water. The Delhi sewage system is also reported to be unable to cater for the city's population. 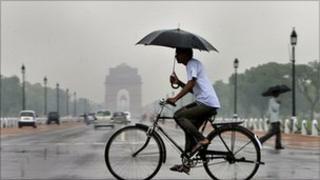 The research team said it believes that temperatures and monsoon flooding make Delhi ideal for the spread of NDM-1. "This is an urgent matter of public health," said Prof Walsh. "We need similar environmental studies in cities throughout India, Pakistan and Bangladesh to establish how widespread resistant bacteria are."